Dead fish along the banks of Indian River Lagoon in Sebastian, Florida. SEBASTIAN – On Thursday, officials found higher amounts of the presence of Red Tide in the Indian River Lagoon, but we still don’t think it caused any of the recent fish kills. Officials have tested areas near Riverview Park and along the shorelines where dead fish were washing ashore and found no Red Tide present. So, it appears to be small patches farther out in the Lagoon. The fish that have been washing up on the banks of the Indian River Lagoon since Wednesday have decay, which indicates these fish have been dead for several days. We believe the wind and current moved some of the fish out of areas hard to reach by cleanup crews. 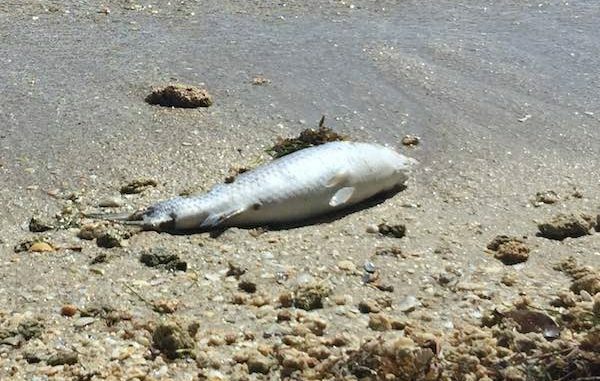 In addition, a couple of commercial fishermen told us that they saw a lot of these dead fish, mostly mullet, coming in through the Sebastian Inlet Wednesday and Thursday from the ocean. The wind was blowing from the northeast, which later changed to east Wednesday night. We believe the fish ended up on the shoreline at areas like the boat ramp on Thursday morning. On Thursday night, there was a large dead sea turtle spotted near Arlo Guthrie’s home in Sebastian. It was approximately 30 inches wide but appeared to be dead for several days. Some fishermen also reported larger fish, such as the goliath grouper and tarpon, floating around the Inlet in the ocean waters. Again, these fish appeared to be dead for days. Farther north from Sebastian, into Micco and Grant, there is another serious problem in Brevard County. 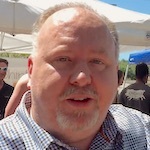 Several areas are testing “high” for the presence of Red Tide. In Sebastian, we don’t think the fish or the turtle died as the result of Red Tide in the Lagoon. We believe they washed in from the Inlet during the fish kill earlier in the week. There is no evidence to suggest that there are new fish kills in the Indian River Lagoon. Now for the good news. A cold front is moving through Sebastian and Vero Beach this weekend that could push Red Tide out to sea. Things could change for the better, rapidly. We’ll be monitoring the beaches and Inlet this weekend.